villa, 6 X 1 Bedroom villas and 1 studio. Cove, Mystic Mountain and more are within 2 miles of our property. any such function or gathering. 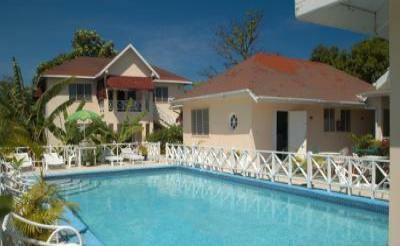 The villas are airconditioned,have hot and cold water ,cable t.v. Photographer is available for special occassions. B.B.Q. area and beautiful gardens. or glass bottom boat ride is available. help select from any nhumber of tours within the vicinity. pineapples, sweet sop, breadfruit and more. plan is included in the room rate. breakfast, lunch and dinner. An additional U$45 per person daily. help select from any number of tours within the vicinity. Cove, Craft markets, Shopping are within 2 miles of our property. birthplace/burial) Fern Gully can be arranged upon your request. drive and can be arranged upon request. accommodated at U$10 for each additional adult. 2 children under 12 years old allowed, free, in each villa. Deposit: 50% required for confirmation.